When I received an email from filmmaker Huw Wahl asking if we could meet for a chat about Herbert Read, I wasn’t sure what to expect. He explained that he was making a film about Herbert Read that, amongst other things, invited participants to respond to Read’s 1941 essay To Hell with Culture. My knowledge of Read stemmed back to my undergraduate days of studying British Modernist art with Read’s son and art historian Benedict Read, but at the back of my mind, I knew that Read had also written about anarchism. I was curious to meet Huw and find out about his project. Herbert Read was a 20th-century British poet, novelist, art critic and writer, and what would now be considered as an anarcho-syndicalist (he had anarchist ideas with a sprinkling of communism). In the art world he befriended and championed a group of young contemporary artists who were to become central to British art historical narratives, including Henry Moore, Barbara Hepworth and Ben Nicholson. Read was well-connected and well-regarded within the art world more widely, advising Peggy Guggenheim on additions to her art collection and counting artists such as Picasso and writers like T.S. Elliot amongst his friends. In 1946 Read co-founded the Institute of Contemporary Arts in London. Six years later, in his review of the British Pavilion at the Venice Biennale, Read accidentally coined the term ‘the geometry of fear’ when he described a group of mid-20th-century sculptors dealing with the aftermath of the Second World War. And the following year, Read accepted a knighthood from Winston Churchill for his services to literature, which became perhaps the most contentious element of Read’s story. Despite his impressive career, his historical role has been minimised in the narratives of British art, with only a handful of art historians devoting pages to his work and legacy. There are many ideas as to why this is the case: some suggest that Read, with his complex and unfashionable political ideas, was written out of the legacy when a Marxist-leaning cultural studies, led by Raymond Williams, became dominant within Britain. Others questioned Read’s commitment to his politics after he accepted his knighthood and because he lived on a large country estate. Nevertheless, there are people who remain interested in his work and this is where the seeds for the Manchester School of Art event To Hell with Culture? Re-examining the Commodification of Culture in Contemporary Capitalism were sown. Initially reluctant to be an interviewee for the film, I returned to the essay to see what Read had to say. In To Hell with Culture (1941) he presents a critique of the commodification of culture, that is, the separation of culture from the rest of life and the financial value placed upon ‘culture.’ In a ‘natural society,’ Read argues, culture should be part of everyday life and not something separate; the idea of a natural society clearly coming from his anarchism. He identified the role that culture has within capitalism, and realised that the ‘appearance’ of culture—an award or two—was added to items to increase their financial value. Adopting a Ruskin-esque argument, Read strongly believed that production should be for use and not for profit. This function, for Read, extends beyond what Socialistsand especially Marxists—would consider as use-value. He understood beauty as central to producing for-use and not for profit and sought to criticise the capitalist co-optation of culture, simultaneously calling for functional art within a democratic society. Despite Read’s assertion that workers would become the collective owners of their respective industries, he maintained a certain conception of the artist in his essay: the Romantic model. The Romantic artist is one based on the individual and to whom Read occasionally refers to as ‘genius.’ Here, Read fights between his politics and his conception of art that was aligned with the beautiful as a spiritual and natural quality. To be socially relevant art has to express the “immediate hopes and aspirations of humanity;” for Read this begins with a democratic culture where education is central and which would, in turn, promote a democratic art. One could argue that To Hell with Culture is almost prophetic in its identification of a culture saturated with the drive for profit (or, to reverse the equation, profit stemming from capitalist form of cultural value). In our contemporary period of neoliberalism we have an ideology that has adopted the traits of the Romantic artist as its own ‘worker’ model and, in Britain at least, coined, identified and compartmentalised the ‘Creative Industries’ as part of a neoliberal capitalist economy. In arguing that Read’s essay is relevant today, Huw and I decided to hold an event that would engage a conversation, taking his essay as the starting point. So we posed a few questions through an open call for papers: What can critically engaged artists, activists and theorists learn through returning to Read’s essay? What role does art/culture/visual culture play under capitalism today? What is being done to critique it? Is it possible to make functional art counter to capitalism? Leah Modigliani (Tyler School of Art, Temple University) opened the day with a reading of The Snake and the Falcon, an adaptation of a 1933 speech given by anarchist Emma Goldman in which she cites Maxim Gorki’s poem of the same name. In the parable, Gorki presents the snake, which lives unseen in the mud and shadows and the falcon that soars up to the heavens but is, ultimately, shot down and killed without regret of having lived. As Goldman asked the attendees to Foyle’s Twenty-Ninth Literary Luncheon in 1933 to reflect on their lives, Modigliani also invited the people in the audience to consider which position they inhabited: the snake or the falcon. By updating Goldman’s speech, she drew attention to the problems still facing contemporary society, highlighting another anarchist writer whose work remains relevant today, posing more questions about the cost of education, personal ideals and the belief in a freedom unencumbered by dogma. The panel on Institutional Contexts presented three different approaches to the idea of the institution: institutionalised shock, the cultural institution and the educational institution. Art Historian Isabel Hufschmidt (Cologne) presented a consideration of the current conditions of contemporary art in its struggle against commodification by focusing on the antagonism between the marketing and commodification of art. She argued that the old avant-gardist strategies of shock (in Dada and Surrealist works, for example) adopted by artists in order to elude institutionalisation, are now becoming the norm. Thus the shock is now institutionalised and further commercialised. To Hell with Culture? participants were invited to don the now-iconic black veil and count with Liberate Tate members, as during their direct action. Turning the focus to a specific cultural institution, Sophie Frost (University of Aberdeen) examined the role of ‘creativity’ within the Southbank Centre, London. She presented an insider’s view of what Eve Chiapello and Luc Boltanski have called the ‘new spirit of capitalism’namely the adoption of ‘creative’ working models (including a ideal worker based on the model of the Romantic artist) in everyday (non-creative) businesses. Frost turned the neoliberal ideology based on the ‘creative type’ back onto a cultural institution to see how ‘creative’ the institution’s day-to-day running actually is. Unsurprisingly, the results of Frost’s study so far shows a few ‘key players’ at the top of the hierarchy hold the creative reigns, whilst those at the bottom—the support staff—have limited creativity within their roles. Findings also demonstrated those in the middle two tiers have to earn their right to be creative, whilst the head of the hierarchy was likened to the “authorial role of artistic genius.” Clearly, within these structures, the division of labour decreases the amount of creative input within each job role. We were reminded of the struggle for arts workers to gain permanent contracts, challenged by groups such as the Carrot Workers’ Collective or the Precarious Worker’s Brigade in Britain. Would Read’s natural society also fall into hierarchical structures when he states that “…it should be possible for people to sort themselves out so that every man and woman is doing the job for which he or she feels naturally qualified…”? Tackling the question of education, we then heard from Joshua Y’Barbo’s Who Needs Read’s Anarchy? Y’Barbo (Chelsea College of Art and Design) moved away from To Hell with Culture to address Read’s 1943 book Education Through Art in which he argues for ‘anarchistic individualism’ in education. Y’Barbo highlighted the privatisation of academic institutions under contemporary capitalism, the commodification of education and the politicisation of students as consumers due to these changes. He returned to Read to propose that anarchistic individualism would be one way to remove individuals from an institutional system in crisis. Keynote speaker Gavin Grindon discussed the organisational and curatorial process of Disobedient Objects at the Victoria and Albert Museum, London. Grindon, an activist and academic, took on the tough challenge of curating an exhibition devoted to objects not usually found in a museum but, rather, on the streets. The objects presented in the exhibition are active, functional, political pieces created by or for activists to be used in moments of struggle and action. A key question surrounding the exhibition is how can objects produced for the purpose of struggle be considered as objects of art or design? Links can be drawn here between Read’s call for a functional art and the objects in the exhibition, such as protest banners, a Suffragette teapot and handmade DIY gas masks—all containing design and function. Some are beautiful, functional objects (as Read believed art should create) including union banners and the Tiki Love Truck, a ‘mobile mosaic mausoleum’ lovingly crafted by Carrie Reichardt and Nick Reynolds. Others had a more DIY aesthetic due to their explicit use-value, like the DIY locks and the roughly stamped paramilitary slogans on British and Irish coins. In usual performative style, Liberate Tate presented a history of their collective, letting us into some of the secrets and tactics of organising ambitious actions within Britain’s largest art gallery: From their first action License to Spill at the 2010 annual summer party, through Human Cost (2011) and a new edit of The Gift (2012) to their most recent action Hidden Figures (2014). Liberate Tate’s actions highlight the relationship between a huge capitalist corporation—British Petroleum—and the British cultural institution that is the Tate galleries, exposing the commodification of culture in its crudest form. Mel Evans, artist and campaigner, took us through the sponsorship figures, which at present point towards a very small financial contribution in exchange for a large corporate branded presence within the galleries. 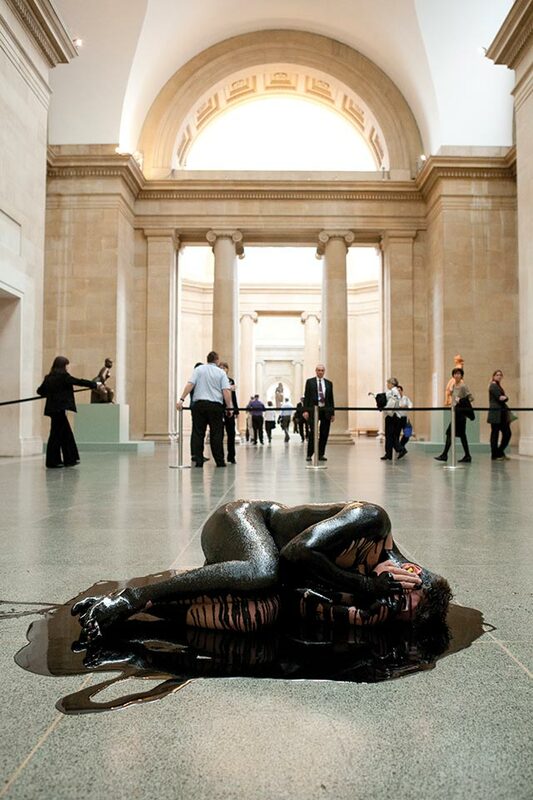 The group, alongside other ‘art not oil’ groups, is currently pursuing a legal battle for the publicisation of the actual amount of money that BP donates to the Tate. The presentation included a discussion of Parts per Million that took place during the opening of Tate Britain’s BP Walk through History last year. To Hell with Culture? participants were then invited to don the now-iconic black veil and count with Liberate Tate members, as during their direct action. The final panel comprised three papers addressing activist practices within art. Sebastian Averill (Loughborough University) used Alain Badiou’s ‘event’ as a starting point for thinking about art’s escape from the commodity. Emma Mahoney (National College of Art and Design/University College Dublin) followed by reviving the ‘meta-anarchistic’ model presented in Simon Critchley’s writings, arguing that the practice of two of our keynotes—Liberate Tate and Freee—could be understood as anarchistic, despite Freee’s Marxist identifications. Mahoney looked at the ideas of ethics, mythic violence, democracy as dissensus, the war of position (from Laclau and Mouffe) and, finally, ‘interstitial distance’ within Critchley’s writings, all of which, she acknowledges in the practices of both groups. Adopting Critchley’s conception of an anarchism that operates within the interstices of the state, Mahoney argued that these groups work at an interstitial distance from the institutions they critique. In the final paper, Paula Serafini (King’s College) looked at groups working beyond the cultural institution. She drew on her ethnographic fieldwork examining the social relations, negotiations and objectives of art activist practices in social justice and environmental activist groups in order to show how an exodus from the institution may be possible. To Hell with Herbert Read! The conference finished with a people’s chorus conducted by Freee art collective. For the occasion, Freee wrote one of their manifestos—To Hell with Herbert Read!—as a rewriting and critique of To Hell with Culture. We gathered in a circle in the atrium to read the manifesto collectively, having been asked earlier to underline the sections with which we agreed and would then read aloud as a group. As the reading progressed, I found myself getting carried away, wanting to read it all as part of a collective voice. The act of reading together highlighted the moments of consensus and dissensus within the group and, afterwards, provoked a heated debate about Read’s intentions, highlighting the Marxist/Anarchist divisions within the participants and the ideas discussed during the day. Some considered Read’s emphasis on the spiritual as essential whilst others thought it was romanticising an artistic practice that should really be functional. The day ended with a screening of Huw Wahl’s To Hell with Culture, returning us to the original inspiration. Danielle Child is a Lecturer in Art History at Manchester School of Art. Her research considers socialised artistic practices in relation to the social, economic and ideological conditions of capitalism.